I don’t know when Memorial Day became a National Day of Grilling. But what was once a day of remembrance, has become a time to relax — with friends, a six-pack or two and a Weber. In other words, meatless burgers are about as tasty as a bowl of plain rice. I guess I should give the O editors props for including a real vegetarian main course — a brown rice and lentil burger — rather than just a side dish like grilled corn. But still. I want more. I want to take the grill back. I want backyards across the nation to fill with the scents of slowly roasting peppers, of carrots and onions — getting sweet and charred, of spicy black bean burgers, and generous slices of corn bread. I want the grill-queens at the Weber hotline to be answering questions about the right temperature for grilling cauliflower and how to stop their portobello mushrooms from drying out. Dammit, I want to hear Sarah Moose-Shooting Palin brag about Todd’s grilled asparagus! Until then, I’m doing my little part to take back the grill. 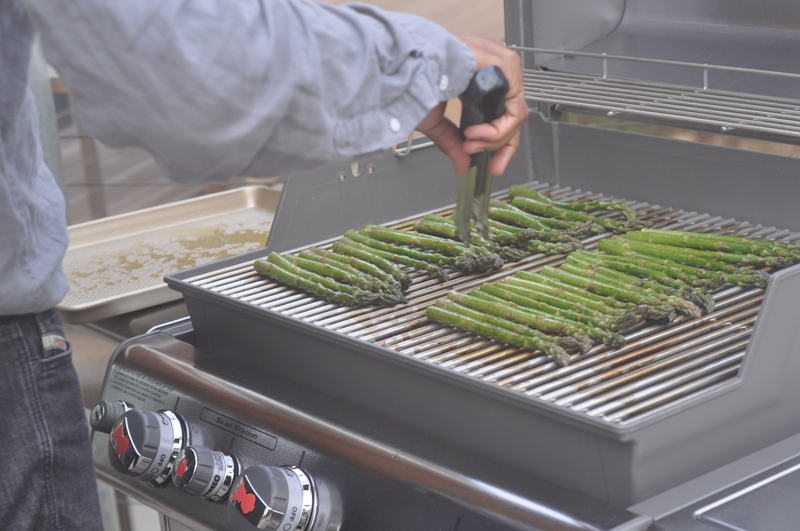 The Professor’s sister and brother-in-law are visiting, and we fired up the Weber on the night they arrived to cook asparagus and pizza. I admit, we did make one or two pizzas with chicken sausage for our Southern guests. 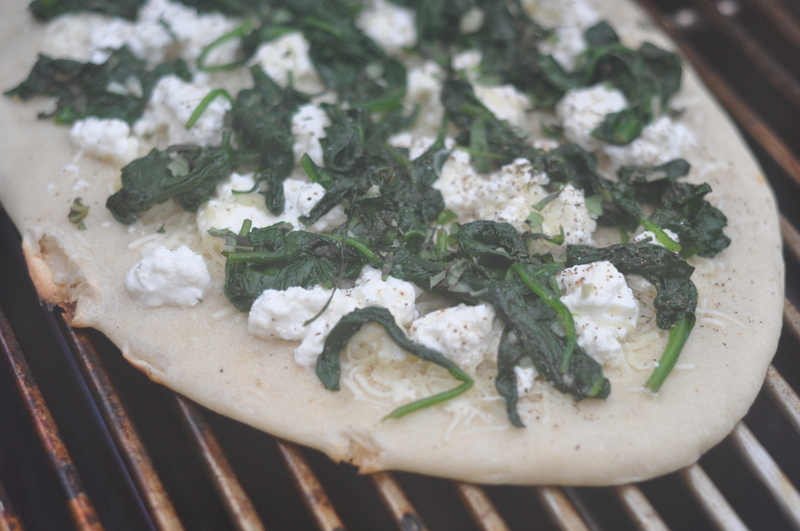 I also made two with garlicky spinach and fresh ricotta. And one with sauteed wild mushrooms. 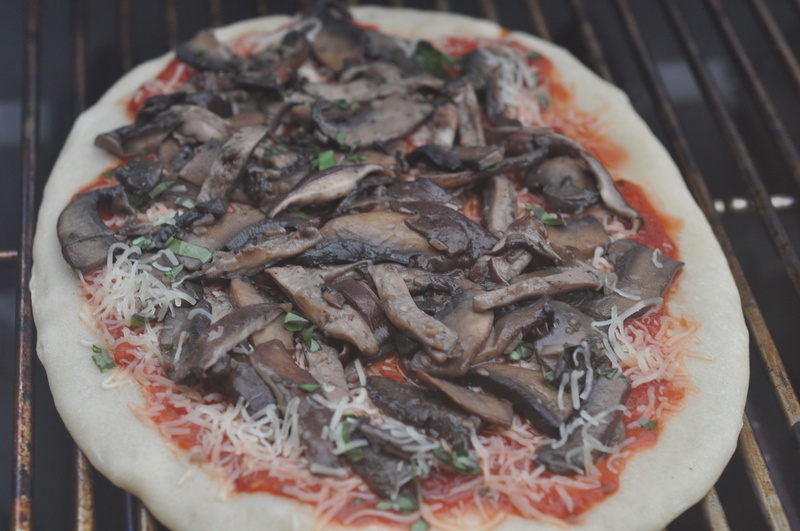 “When you make a mushroom pizza, you do not joke around,” said The Professor as he carried my portobello- and shitake-smothered pizza to the grill. He’s right. And hmmm, hmmm was it tasty. › Newer Post Ciao Food Pyramid!